Press +: To increase the volume. Press -: To decrease the volume. Press : To select the next preset radio station. Press : To select the previous preset radio station. Press and hold : To select the next station with strong reception. Press and hold : To select the previous station with strong reception. Press : To skip to the next song. Press : To go back to the beginning of the current or previous song. Press and hold : To skip to the next folder. Press and hold : To go back to the previous folder. Some modes appear only when an appropriate device or medium is used. 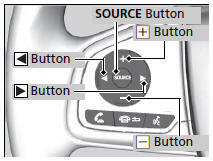 Depending on the Bluetooth’ device you connect, some functions may not be available. Allow you to operate the audio system while driving. 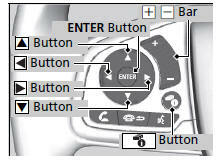 The information is shown on the driver information interface. 1. Press ENTER to switch the display to a preset list you stored in the preset buttons. 2. Press or to select a preset, then press ENTER. 1. Press ENTER to display the folder list. 2. Press or to select a folder. 3. Press ENTER to display a list of tracks in that folder. 4. Press or to select a track, then press ENTER. You can also swipe up or down to scroll through the list of tracks alphabetically. Press the (Hang-up/back) button to go back to the previous command or cancel a command. Press the button to switch display. 1. Press ENTER to display the iPod music list. 2. Press or to select a category. 3. Press ENTER to display a list of items in the category. 4. Press or to select an item, then press ENTER. Press ENTER and press or repeatedly until the desired mode you want to listen to is displayed. 1. Press ENTER to display the station list. 2. Press or to select an item, then press ENTER. 1. Press ENTER to display the track list. 2. Press or to select a track, then press ENTER. Press+: To increase the volume. Slide your finger up or down to increase or decrease the volume, respectively. Swipe down quickly to mute the volume and swipe up to cancel the mute. Press and hold : To select the next strong station. Press and hold : To select the previous strong station. Press and hold : To select the next station. Press and hold : To select the previous station.